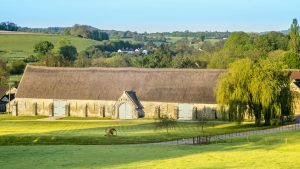 Messums Wiltshire, the acclaimed new arts centre housed in a restored tithe barn, will open the third and final part of its series exploring the human form with a unique immersive choral work, Song of the Human, by composer Pete M. Wyer. A UK premiere, Song of the Human is inspired by the idea of how we communicate in music and the restorative power of birdsong for the human mind. Song of the Human, which was premiered in New York last October at the World Trade Center, is created within a sonic installation. Visitors to the vaulted space of the great barn, with its cathedral-like acoustic, will experience music performed by Philadelphia-based choir The Crossing amidst a dawn chorus of birdsong. The installation at Messums Wiltshire features unique recordings of the English dawn chorus, recorded simultaneously with 18 lines of audio in Cornwall, Suffolk and Dulwich woods, London, and also includes a chorus of extinct birds. The work also aims to reproduce the restorative effects of birdsong for psychological wellbeing. People find birdsong reassuring and calming because thousands of years ago, and still in some wild places in the world, birdsong signifies safety based on a lack of predators, and plentiful resources for survival. So low-level anxiety is often experienced when people cannot hear birdsong. The piece is composed in seven movements. In the first movement, Wyer’s intention is to create a feeling of encountering other humans as though they are a different species. In the dramatic penultimate movement the choir battles the elements in the form of a storm, acting as a metaphor for the struggle we each face in reaching a point of acceptance of our own nature. 2) Birdsong is also nature’s alarm clock, with the dawn chorus signalling the start of the day, so it stimulates us cognitively ‘The Surprising Uses for Birdsong’, BBC: http://www.bbc.co.uk/news/magazine-22298779. Part I of the series, Conceal | Reveal, was a dance performance by the internationally renowned Russell Maliphant Company. Part II was Deformation l Transformation, in which Laurence Edwards, Sean Henry and Brian Taylor explored the language of figure in medium of sculpture.